From valleys full of tradition and culture down below to the mountain world up high… Passing Romeo & Juliet's balcony in Verona, through the canals of Venice… Discover the vast enchanting variety of the area on an excursion through South Tyrol. Come face to face with Ötzi, glacier mummy from the eternal ice. Experience the natural diversity in the delicate changes of the seasons. 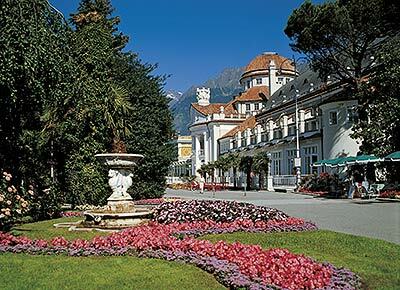 Vibrant traditions in Merano and Bolzano, idyllic mountain villages and quaint alpine huts. Cultural highlights from all epochs of history, from the ice age to modern times. The Martell Valley is a southerly aligned side valley of the Venosta Valley / Vinschgau and is nestled in the Stilfser Joch National park. The Cevedale Group, with the 3,769 metre high Monte Cevedale as its main peak, denotes the end of the valley. A variety of different plants and flowers are particularly prominent in the Stilfser Joch National Park thanks to the large difference in altitudes. 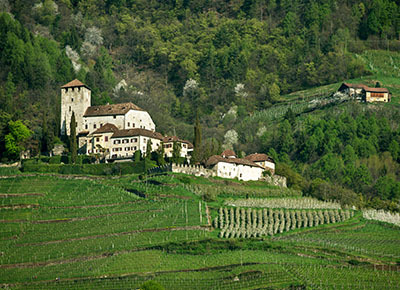 The Martell Valley has advanced to become the stronghold of strawberry cultivation in South Tyrol. The strawberries here grow between altitudes of 900 to 1,700 metres and their harvest is celebrated annually with the strawberry festival heralded as the preceding event. The Zufall Hut, situated at over 2,265 metres in altitude, offers great refreshment and accommodation options both in summer and winter. Hiking & adventure tip in the summer: the unique strawberry trail. The Martell Valley is ideally suited to leisurely cross-country skiing and is perfect for enjoyable sledge runs. The Schnals Valley begins directly behind Naturno / Naturns. The slopes are covered with lush larch forests, which is why this region is also known as "The valley of the larches". Numerous idyllic alpine farming estates can still be found here with their original wooden structures - a great insight into the life of South Tyrol from generations gone by. “Ötzi" the glacier mummy was found in the heights of the Hauslabjoch in 1991. Experienced mountain hikers can visit the place of discovery with a 6-7 hour hike. The Schnalstal glacier cable car system can be found to the end of the valley, with which you can reach a height of 3,200 metres, where magnificent views and numerous tours await you. 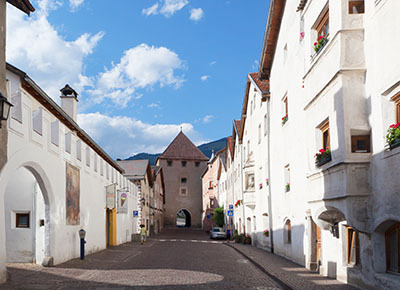 Glurns is the only town in Tyrol with curtain walls and towers. Nowhere else can visitors comprehend how medieval life was as they can in the small town of Glurns, home to 850 inhabitants, with its historical town walls, defence and gate towers as well as arcades and alleyways. The founding of the town of Glurns dates back to Count Meinhard II (1271- 1295) and served to extend the territorial dominion in the Upper Venosta Valley / Vinschgau against the prince-bishop of Chur. Glurns was a significant transport hub, market town and trading centre for salt, yet was destroyed in the Battle of Calven in 1499. Glurns has only undergone modest changes in its structure and size since the rebuilding process between 1500 and 1520. 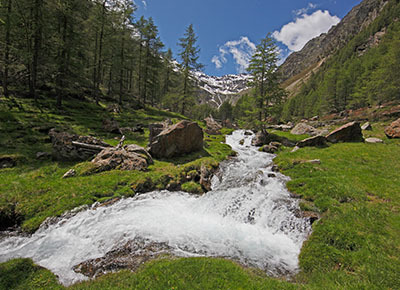 The Sulden Valley – a true paradise for hikers and skiers – can be reached in around an hour from Naturno / Naturns. The glacier cable car system will take you up in comfort and promises fantastic panoramic moments. The basin of the valley belonging to the Stilfser Joch National Park at 1,907 metres is bordered to the south west by the highest mountains of South Tyrol, the Ortler (3,905 m) and the Königsspitze (3,859 m). The Düsseldorfer Hut (2,724 m) and the Schaubach Hut (2,661 m) are places worth hiking to with impressive views over the Ortler Group. Unforgettable panoramic moments on the mighty faces of the Ortler await those conquering demanding hikes to the Tabaretta Hut (2,556 m) or the Payer Hut (3,029 m). The Ulten Valley extends from the Stilfser Joch National Park to Lana in the Merano region and offers much variety for mountain hikers. 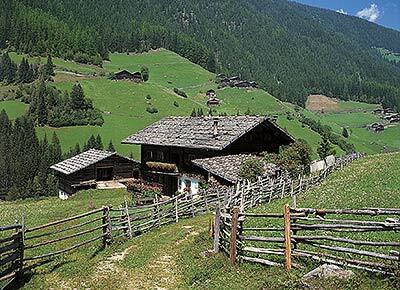 The Ultner Farm Trail is one of the most popular valley hiking trails in South Tyrol. With a hiking time of 5 hours, the trail passes the most beautiful and oldest farmsteads in Ulten. This hike is also very suitable for those with minimal experience due to the low altitude difference of only 300 metres. The small, quiet ski resort of Schwemmalm awaits winter sports enthusiasts in the middle of the Ulten Valley. "Preserving and maintaining the nature of the mountains and the cultural assets from around the world." is how Reinhold Messner describes his vision, which has become a reality on the mountain edge steeped in history (approx. 1,000 metres) between the Vinschgau and Schnals Valley. Exemplary restored, culture, nature and tourism come into a harmonious symbiosis in Juval. Life as it was over 5000 years ago: the archeoParc Schnals is situated at a height of 1,500 m above sea level in the village of Unser Frau in the Schnals Valley, approx. 20 minutes away from Naturno / Naturns by car. The past as Ötzi knew it is brought back to life vividly in this archaeology park with outdoor area. The land of castles is not only the destination most deeply enriched with tradition in South Tyrol, but also the historical heart of Tyrol. 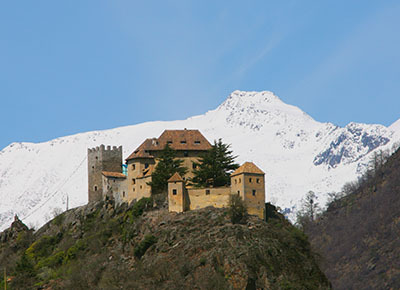 The greatest density of fortifications and castles can be found here from all over Europe. A documented total of 32 can be found just in the vicinity of Merano alone. The balneal town Merano - Shopping. Culture. Entertainment. The balneal town Merano is just 15 minutes away from Naturno / Naturns. This small town made the leap during the royal and imperial period to become a spa town with world renown. The mild climate and the especially pure air still entice numerous visitors from all over the world even today. Merano was the centre of the Duchy of Tyrol for centuries. A number of buildings, primarily fortifications, estates and castles, which have survived three centuries and provide a valuable addition to the historical heartland of South Tyrol, all originate from this splendid period. 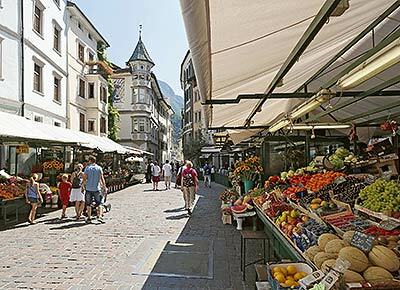 There are also a variety of cultural sights and shopping opportunities throughout the Merano region. Lake Reschen and Graun – the church tower in the lake. The entire village of Graun and a large part of the village of Reschen were plunged into the artificial lake created in 1950 for the generation of electricity in the floodplains. 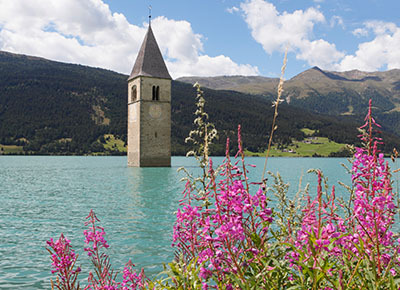 Today the Romanesque church tower from the 14th century, which rises from Lake Reschen, still bears testament to the submerged Alt-Graun. A hiking, Nordic walking and running track at a length of 15.3 kilometres leads around Lake Reschen. The relatively high wind speeds make various sports such as kite surfing in the summer or ice sailing, snow kiting and ice surfing during the winter possible. The International German Snowkite Championships have also been held on the frozen Lake Reschen since 2008. The Stilfser Joch is situated at an impressive height of 2,757 metres, the highest mountain pass in Italy, which connects South Tyrol with the Lombardy. Positional fortifications from the First World War can still be observed there. 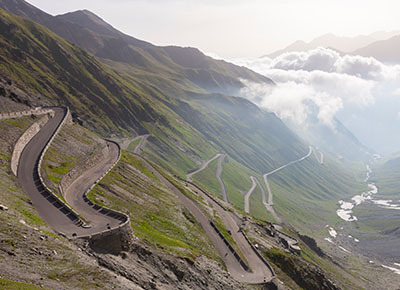 Even the mountain pass itself breathes history: the route, which is open from the end of May until November, has hardly changed since its construction in the 1920s with 48 impressive twists and turns. The Stilfser Joch attracts thousands of keen athletic cyclists every year thanks to its winding route. The "Giro d'Italia" cycle race also frequently crosses over the Stilfser Joch. A "cinematic" play of nature on the high plateau above Hafling and Vöran. "Knottn" means "rock" in the South Tyrolean dialect. 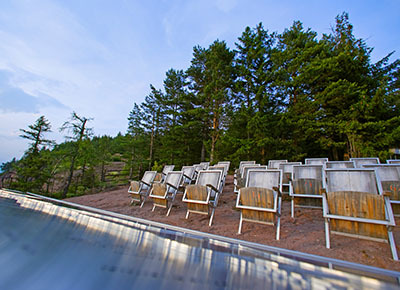 The Knottnkino consists of 30 cinema seats made of steel and chestnut wood and encourages hikers to take a seat and enjoy the unique views over the Etsch Valley, as if they were sitting in a cinema. The entire Etsch Valley captivates from this "movie theatre" with the Merano basin, the side valleys branch off as if forming a star shape. The Dolomites rise majestically behind and the peaks of the Ötztal Alps and the Texel Group nature park can be identified on the horizon. A visit to the Knottnkino can be wonderfully combined with a circular hike. Urlärchen - silent witnesses of time. 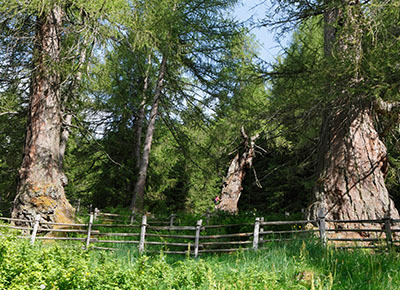 The three famous Urlärchen larch trees can be found at a height of 1,430 metres in St. Gertraud in the Ulten Valley. The trees, which have been largely weathered by storms and wind, are the oldest coniferous trees in Europe – over 2000 year rings were counted on one larch tree that overturned in 1930! This means that the trees have already seen the rise and fall of the Roman Empire and the thousand-year-old German Empire. Impressive living proof of the tenacious will of nature to survive. 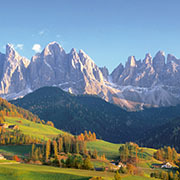 The state capital of Bolzano is just a 30 minutes’ drive from Naturno / Naturns. The famous Archaeology Museum is a highlight in this charming town, offering a discerning and equally entertaining journey through 15,000 years of history of the southern Alpine region. 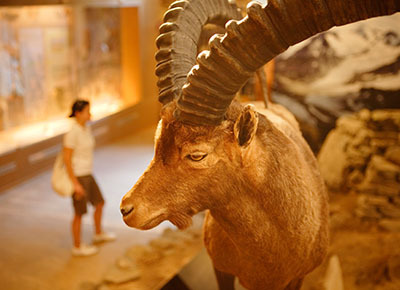 The legendary Ötzi The Iceman and his accompanying artefacts form the central exhibition complex in the museum. The circa 5,300-year-old glacier mummy is preserved in one of the innovative conservation installations. The well-preserved parts of the clothing and equipment provide a relatively realistic notion of how life was like for prehistoric humans. 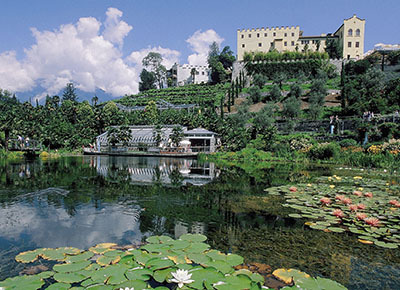 Only 20 minutes away from Naturno / Naturns, the botanical gardens of Trauttmansdorff Castle above Merano provide mind-blowing impressions into the diversity of nature across all seasons: forest gardens, sun-drenched gardens, orchid house, cacti pavilion, water and terraced gardens, floral clock, Sisi promenade and much more await you. The "Garden Nights" at the Trauttmansdorff during July and August is now one of the most significant world music festivals of Northern Italy and attracts an ever increasing audience into the atmospherically illuminated amphitheatre surrounding the water lily pond. Lake Kaltern lies nestled in the typical vineyards of South Tyrol to the south of Kaltern, not far from Tramin, the native place of the Gewürztraminer wine grape. The warmest bathing lake in the Alps enjoys temperatures reaching 28°C during the summer. A paradise for water sports fans: there are also numerous sailing and windsurfing opportunities alongside rowing and pedal boats here with a beautiful circular hike also taking you around the lake. 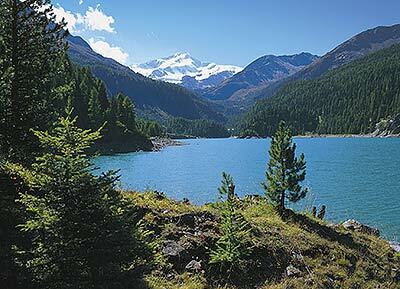 The South Tyrolean wine trail also passes Lake Kaltern - a good opportunity for you to sample some noble local drops. 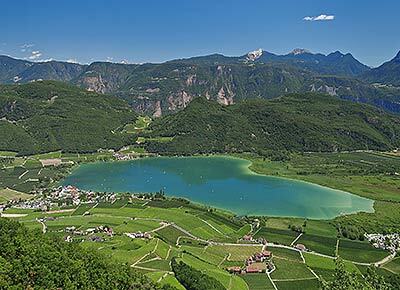 The Dolomite route features some of the most beautiful views of the Dolomites and is one of the highlights of taking a holiday in South Tyrol. King Laurin's rose garden can be reached via the Karer Pass through the romantic Eggen Valley. 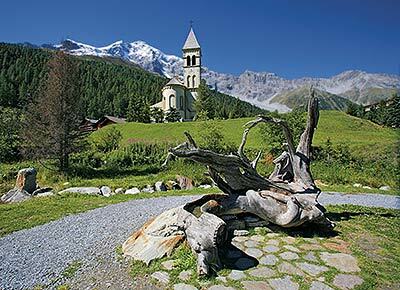 You then continue on into the Fassa Valley towards Canazei until reaching Lake Fedaia at the foot of the Marmolada. The natural spectacle on the Sellajoch is also impressive: the massive Sellastock sits to the right and the Langkofel to the left. Time for a coffee break in St. Ulrich (Gröden Valley) and then head back through the Eisack Valley via Bolzano to Merano. We recommend experiencing this wonderful round trip and beautiful mountain landscape up close with our Dolce Vita convertible. 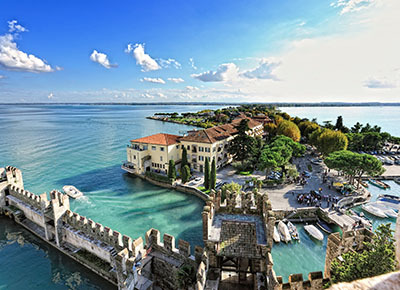 Lake Garda can be reached in just 2 hours (150 km) from Naturno / Naturns. Ideal for a day trip with the convertible! This is Dolce Vita at its very best in one of the most popular holiday regions in Northern Italy. The "Serenissima" was built on 118 islands, criss-crossed by countless canals and connected by over 400 bridges. The former prosperity of the trading town can still be comprehended today in the palaces and churches. Oriental flair, stringent Gothicism and formidable renaissance form a fascinating unity in the Doge's Palace. 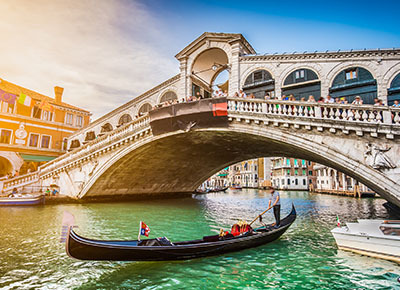 The Canale Grande remains the "most beautiful street in the world" with its palaces and bridges (Rialto). Venice can be reached in 3 hours (294 km) from Naturno / Naturns - perfect for a day trip. 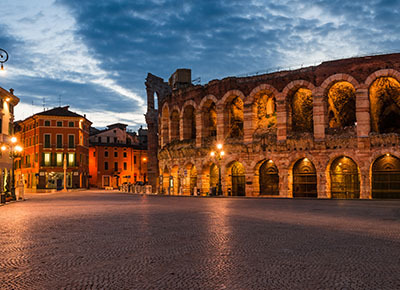 Verona Arena is certainly one of the most famous amphitheatres worldwide. There are famous operas on show each week from the middle of June until the end of August such as Aida, Nabucco or Carmen. Verona can be reached in only 2 hours from Naturno / Naturns (180 km). We recommend taking a sightseeing tour through the city steeped in tradition, passing the balcony of Romeo and Juliet and then an unforgettable visit to an opera performance outdoors afterwards.